The following screenshots are intended for helping users accessing IPCC-DDC AR5 data in WDCC. If you need more information on IPCC-DDC please refer to http://www.ipcc-data.org/, information on the WDCC background can be found on http://wdc-climate.de/. General usage information for data download from WDCC is available at https://cera-www.dkrz.de/WDCC/ui/cerasearch/docu. 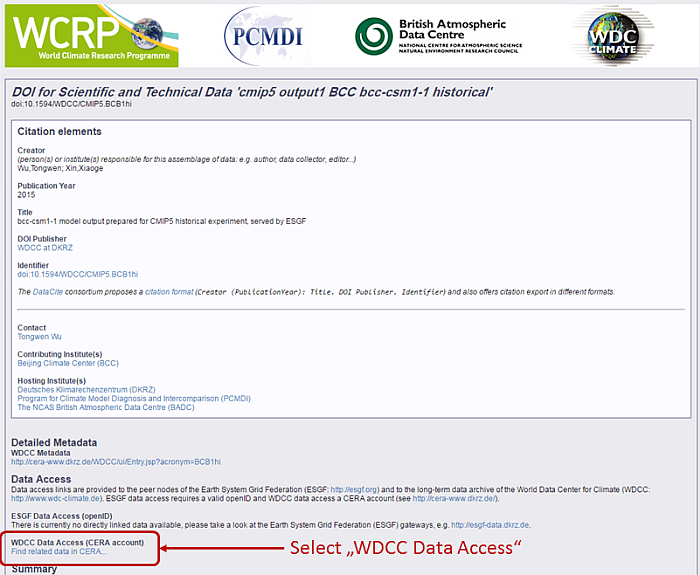 Most likely you will reach WDCC pages by clicking on the grey or green links on the IPCC-DDC AR5 Archive pages. The following screenshots guide you through the steps required starting from the DDC page until the download starts. in addition to the download using the GUI, a batch tool "jblob" is available (and recommended) for accessing data. 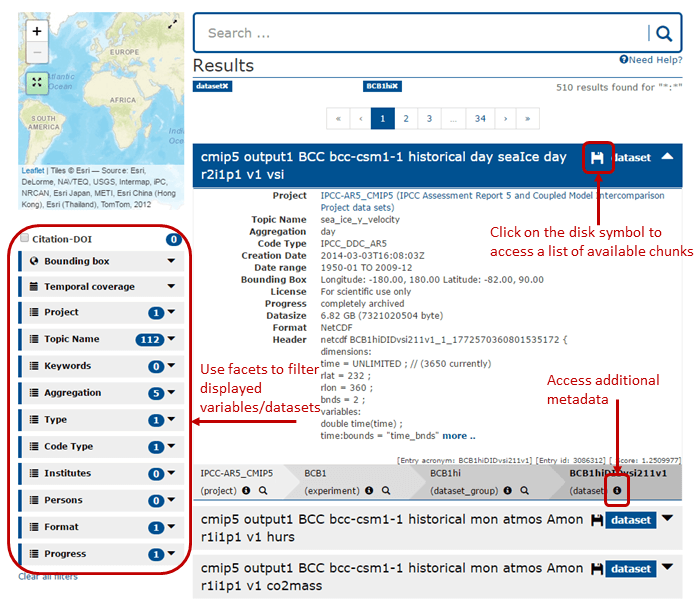 More information on jblob can be found at https://cera-www.dkrz.de/WDCC/ui/cerasearch/info?site=jblob. 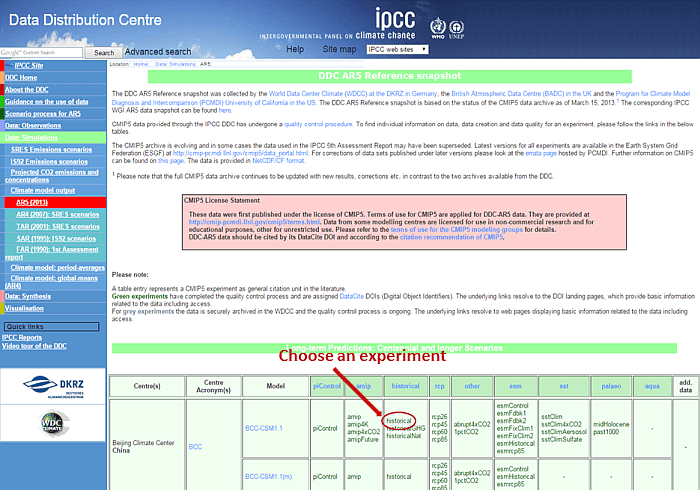 Choose an experiment on http://www.ipcc-data.org/sim/gcm_monthly/AR5/WG1-Archive.html or http://www.ipcc-data.org/sim/gcm_monthly/AR5/Reference-Archive.html, this will lead you to the WDCC landing page for the selected experiment. Clicking on the link "WDCC Data Access" will take you to a list of available variables/datasets. On this page all available variables/datasets are listed, clicking on the disk symbol will take you to the chunk list for the corresponding variable. You can use the facets on the left area to filter the list. Code list for IPCC DDC AR5 data in the CERA database. Login using your CERA account, if you don't have one please go to https://cera-www.dkrz.de/WDCC/ui/cerasearch/register. Download the chunk(s) you are interested in by clicking on the disk symbol. Important: The download may not start immediately after clicking on the disk symbol because most of the datasets are stored on tapes and have to be copied to a disk cache before transfer. The download will be started after this process is finished!